The Exam Essentials Practice Tests series provides students with an invaluable combination of exam information, task guidance and up-to-date exam practice. 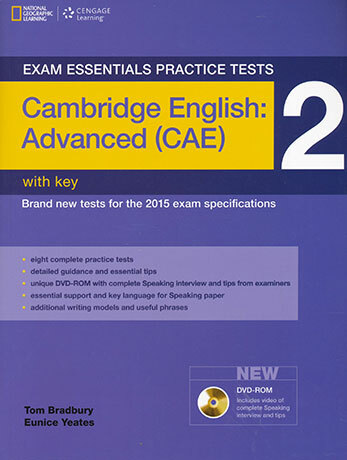 The tests are written by experts in the field, and are at least the same level as the real Cambridge English: Advanced exam. Students can be confident that if they do well in the Practice Tests, they’ll do well in the real exam. The tests offer practice in all four papers of the exam: Reading and Use of English, Writing, Listening and Speaking. Eight complete practice tests cover a wide range of typical exam topic areas. Essential tips in Tests 1, 2 and 3 explain how best to approach each task type and give guidance on typical exam questions. Language banks offer students model responses for the Speaking paper. A Glossary includes helpful definitions for the key language items in the reading texts. A Writing bank gives students valuabie information about the tasks in the Writing paper, along with complete model answers and useful phrases. Exam overview gives an at-a-glance summary of the format and task types of each paper in the exam. An annotated Answer key contains detailed answers for each task, with explanatory notes and some additional information on incorrect answers. An Audio script of all the recordings includes underlined sections to show where the answers can be found. A DVD-ROM containing video of a complete model Speaking interview with useful tips for examiners and accompanying worksheet allows students and teachers to see exactly what the Speaking test entails. Exam-style Audio recordings on the DVD-ROM give students an authentic taste of the Listening paper.